The researchers who captured the first-ever images of a black hole don’t plan to rest on their laurels. Those contours outline the black hole’s event horizon, the famous point of no return beyond which nothing, not even light, can escape. The epic achievement further bolsters Einstein’s theory of general relativity, which describes gravity as a consequence of the warping of space-time. 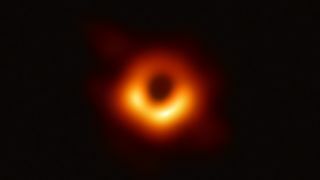 And the newly unveiled images should help scientists better understand how black holes tick, and how the biggest ones — such as the M87 monster, which harbors the mass of 6.5 billion suns — shape the evolution of their host galaxies, scientists said. But that doesn’t mean the project’s work is done — far from it. For example, it should be possible to sharpen the existing images using algorithms, EHT director Sheperd Doeleman, of Harvard University and the Harvard-Smithsonian Center for Astrophysics, said during a press conference yesterday. Sagittarius A* is more variable over short timescales than the M87 black holeand is therefore more difficult to image, Doeleman said. But the team is optimistic that it will be able to pull a picture of Sagittarius A*’s event horizon out of the data as well. “We’re not promising anything, but we hope to get that very soon,” Doeleman said. The EHT integrates multiple radio telescopes around the world, forming a virtual instrument the size of Earth. (You have to go that big to resolve the two supermassive black holes, which are incredibly dense but quite small, volumewise, on a cosmic scale.) During the 2017 run, eight dishes in six different locales comprised the EHT megascope. The team added one dish, in Greenland, for the 2018 campaign, “which dramatically increased our coverage to the north on M87,” Doeleman said. And that’s just the near future. Over the longer haul, the collaboration would like the virtual scope to include an off-planet dish. EHT isn’t the only project shining significant light on black holes. For example, NASA’s Nuclear Spectroscopic Telescope Array (NuSTAR) spacecraft is hunting for, and helping to characterize, supermassive black holes around the universe. And future projects — such as the European Space Agency’s Laser Interferometer Space Antenna mission, which is scheduled to launch in the mid-2030s — will aim to spot gravitational waves generated by mergers of supermassive black holes. “The subject of black holes is [ready] for prime time,” said Avi Loeb, the chair of Harvard’s astronomy department and founding director of the university’s interdisciplinary Black Hole Initiative.